The mirror terrace is not a terrace. What can the dust cling to? This is a poem written by the 6th generation ancestor of the Chan sect, Huineng, which is widely circulated. Because of this poem people of later generations believe that there is no Banyan tree at all. But as a matter of fact, this is only common people�s misunderstanding in the realm of the poem. Banyan tree is in real existence, and it is a kind of tall arbor tree. When Huineng wrote the poem �there is no Banyan tree at all�, it might be an extension of the Buddhist theory of �the four elements (water, earth, fire and air) are all void�. Banyan is the pronunciation for the word �Bodhi� in ancient India language, and it means consciousness or intelligence. It refers to the state when a person becomes �awake� for something suddenly or comes to realize the truth or reaches an outstanding level in comprehending the world. In the English language, Banyan is written as �peepul�, �Bo-Tree� or �Large-Tree� etc., and they all take on the meaning of generous, open-minded, and discriminating. The Latin name of Banyan is ficus religosa, which has the meaning of �holy religion�. Banyan trees seem to have a natural relation with Buddhism. According to the legend, the Founder of Buddhism, Sakyamuni, was a prince of an ancient kingdom in the north of India in ancient times. In order to rescue people from the transmigration of living, aging, illness and dying, he gave up his position and his cozy life, became a monk, and began to seek for the true meaning of life. After many years of practice, once when he sat under a Banyan tree for 7 days and nights, during which he had battles with all wicked things in his minds, he achieved great awakening at dawn and became Buddha at last. Thereafter, Buddhist believers all regard Banyan trees as holy trees and India also elects Banyan tree as her national tree. Two thousand years have passed, the Banyan tree where the Founder of Buddhism achieved great awakening has become the symbol of Buddhism. In Mount Putuo Cultural Relics Exhibition Hall of Zhejiang, China, there are still four Banyan leaves on display. It�s said that the leaves are collected from that tree; the leaves are treated as treasures in all generations and are endeared by all people. In 1954, the Indian Premier, Nehru, paid a visit to China, and he brought with him a young tree cultivated from that tree under which Sakyamuni became Buddha. He presented the young tree to Chairman Mao and Premier Zhou to express the friendship between the two nations. Afterwards, Premier Zhou donated that young tree to Beijing Botanical Garden of the Chinese Academy of Sciences. Both leaders and common mass of the garden put sufficient emphasis on the caring of the young Banyan tree. Today, the tree is still growing very well and is exuberant. Every time when famous foreign monks come to visit China, this Banyan tree will be invited out to accept their worshipping. During the �cultural revolution�, the Botanical Garden was charged as a �feudal, bourgeois, and revisionist� unit and the employees were all exiled to other parts of the country. That Banyan tree was also forced to leave the botanical garden and became destitute. What is lucky is that, an observant and conscientious person hid the tree secretly and made it survive the disasters. After the 10 years riots of the Cultural Revolution, the leaders and the employees of the Botanical Garden tried to seek for the tree everywhere. They visited dozens of horticultural units and found it finally. For the time being, with the good cares of the employees, the Banyan tree grows very well. It symbolizes that the friendship between the Indian and the Chinese people will last forever and ever. According to our investigation, originally China does not have Banyan trees. They were introduced to China as Buddhism spread to China. According to historical records, a monk of the Liang Dynasty, Zhiyao, brought back some Banyan trees from ancient India and planted them personally in Wangyuan Temple of Guangzhou. Then China began to have Banyan trees. Afterwards, as Buddhism became flourishing in China, Banyan trees were widely planted in the temples in South China. Today, we can still see three Banyan trees with ages of more than 300 years in Haizhang Temple of Guangzhou. The Dai folks in Xishuangbanna all believe in Buddhism. They are quite ardent and pay sufficient respect to Banyan trees. Banyan trees are planted in nearly all temples and villages, because people there believe they have supernatural powers. For example, if someone does not feel well, or his or her chickens or pigs die of diseases, he or she will plant some Banyan trees, hoping God will bless him. On occasions such as Buddhist festivals, ardent believers will tie ropes on large Banyan tree branches, and they will place their sacrifice before trees and willkneel down to worship. The Dai folks dare to fell any other trees but Banyan trees; what is more, they can not use the branches of Banyan trees as fuel even if they are drying, because they think it is a crime for people to cut down Banyan trees. Before the Liberation, in the laws established by the Dai landlords, there were usually clauses such as: �whoever cut down Banyan trees, his children will be sent to the temples as slaves�. In the literary works of the Dai people, Banyan trees are also regarded as symbols of the holy, the auspicious, and the noble. On wedding ceremonies, the singer will sing: �today is the day when Banyan trees go to heaven�. In love songs, young girls sing to their lovers: �you are a tall Banyan tree�. Besides, there is a Dai proverb that says: �Never slough off your parents and never fell Banyan trees�. One can see Banyan trees everywhere in Xishuangbanna. Amongthem two trees are worth mentioning. One grows in Mandahe Village, Menglong Town, Jinghong city, which has a chest diameter of nearly 2 meters. Usually, Banyan trees we see have green branches and leaves; however, this Banyan tree also has white branches and twigs besides green ones. Each year it grows one or two new white branches. According to the local folklores, once when Sakyamuni went out, he took a rest under this Banyan tree. In order to express its gratitude to the ancestor, the tree grew out white branches to thank the bless of Buddha. The local Dai folks regard this tree as a �holy tree� and they build walls around it for protection. Each year, when the tree grows out white branches, the worshippers and visitors will swarm there to have a look. The other tree grows nearby in Jiaoman Park, Jinghong city. The trunk of the tree is very big and it neeeds five adults to encompass it with outstretched arms. It�s said that this tree has an age of over 800 years. It still grows very well and is still branchy and exuberant. The tree has a brother tree of the same age in Thailand. Theywere planted by two close friends who held positions of throne. The two friends were originally common people. After many years of struggles and backbreaking labors, they became kings of Thailand and Xishuangbanna respectively. The Thailand king first came to pay a visit to Xishuangbanna and he planted a Banyan tree there. The Xishuangbanna king went to Thailand and planted the other Banyan tree in Thailand. They both wished that the two trees would grow together and the friendship between the peoples of Thailand and Xishuangbanna would last forever. Until now, the local folks still love the tree very much. Banyan trees not only have many moving stories, they also have quite broad uses. The tree trunks are thick and mighty, and the tops of the trees are like canopies. Therefore, they ccan be planted on roadsides as ornamental plants. The tree leaves are heart-shaped and good-looking. If they are saturated in cold water for some time, after taking off the fillings, we ccan get some transparent and netlike veins, which are usually called �Banyan silk�. It is mothproof and ccan be made into bookmarks. The Banyan trunks and branches are rich in a kind of white milk contents, which can be made into hard balata. If people use the milk to rinse, it can also cure toothache. 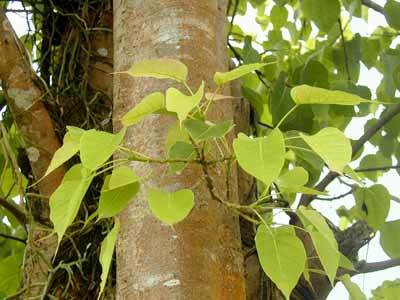 The leaves of the tree are medicines and have sudorific and pain-killing effects. Many aerophilous roots may grow on the branches and form the scene of a �one-tree forest�. In India, SriLanka and Burma, the local folks often cut down such roots to feed elephants.